Carpet flooring is an excellent choice due to the many benefits it comes with. Aside from providing you with a full assortment of colours and patterns to choose from, you also get a magnificent selection of additional advantages which we discuss here. There is a lot to choose from in terms of design, style and texture, offering the greatest levels of versatility. Carpets have a wonderful variety of patterns and colours to decide from. Personalise your colours to transform your décor and ensure you achieve a personalised indoor environment. Whether you want neutral colours or bold patterns, you’re guaranteed to find a carpet that fulfils your specifications. 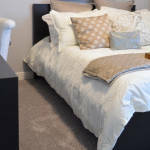 Whether you’re choosing a carpet for your home or office, a high-quality carpet can drastically help by reducing the volume of noise that is being produced. Carpets located in especially high traffic areas can absorb the sound and allow you to enjoy a peaceful environment. As opposed to hard surfaces that reflect sound, carpets can absorb sound to ensure your environment remains quiet. Carpets can significantly enhance your indoor conditions. Unlike hard flooring surfaces, having carpets ensures that your living room or bedroom floors won’t be cold to the touch, which means walking barefoot is a delightful experience. This improvement is as a result of the carpets ability to retain heat. Carpets are one of the safest flooring types you can choose, and they are particularly relevant if you have children in the house. Compared to different flooring types, carpets provide much safer environments by offering more friction which prevents slips and falls. Carpets offer safer environments due to their cushion-like effect. Furthermore, in the event you do fall, the cushion-like effects ensure you have a safer landing which can help prevent serious injuries. New technologies have been created which allow for old carpets to be recycled into new carpets. Carpets manufactured with recyclable material ensures that you make a contribution towards conserving the environment. With an extended lifespan, you get to enjoy the benefits that carpet flooring allows without worrying about regular replacements. When correctly installed and maintained, carpets retain their appearance for an extended period of time so you don’t have to worry about replacements for a long time. In general terms, carpets can cost less than other flooring types for your home, being less expensive than other materials such as hardwood. Solid hardwood or vinyl floors can look fantastic but can require special preparation before being installed. Carpets typically have much less rigorous installation requirements. This can save a great deal of money for customers. Carpets are perfect flooring solutions that have many benefits. Aside from having a long lifespan, high-quality carpets ensure you have a comfortable indoor environment. Correct installation and maintenance ensure you don’t have to worry about regular replacements. Carpets come in different colours and patterns that ensure you express your style. If you have any questions or queries, please do not hesitate to get in touch with Millwill Furnishers.